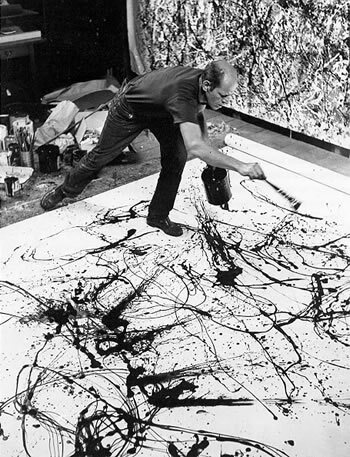 A robot painter named "Action Jackson" mimics the painting techniques of Jackson Pollock, the American abstract impressionist painter. 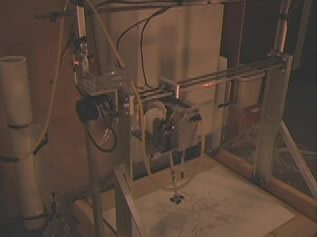 The robot painter was created by Washington University mechanical engineering student Topher McFarland. Action Jackson does not follow a "paint by the numbers" software program; the robot painter has what McFarland calls its "hacked together" quality. The robot's processor was snatched from an old university satellite project. An old peristaltic pump — often used for blood — pushes the paint around. And empty Bic pens serve as sheaths for control wires. Still, it does pretty good work. MacFarland is working on adding two more colors and more motion. The robot is controlled by a program called "404" - the number of the class in which Action Jackson was built. 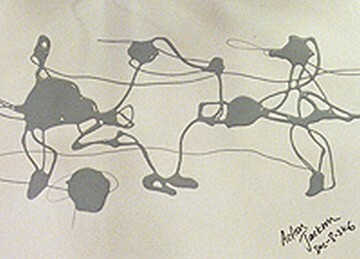 From Robot makes drip paintings like Jackson Pollock's via primidi. See also the short video Washington University.